I’ve just updated the gallery with episode stills from the most recent episodes. Enjoy! I’ve just updated the gallery with episode stills from the most recent episode plus some stills from the upcoming 2 episodes. Enjoy! The massive conspiracy at the heart of Designated Survivor took a sharp turn in the past two episodes of the ABC drama, which culminated with Peter MacLeish (Ashley Zukerman), a veritable Manchurian Candidate recently appointed to the role of vice president of the U.S., getting shot to death by his own equally traitorous wife — who proceeded to then turn the gun on herself. It was a massive moment for the ABC political thriller, an escalation of the stakes when the stakes were already tremendously high. 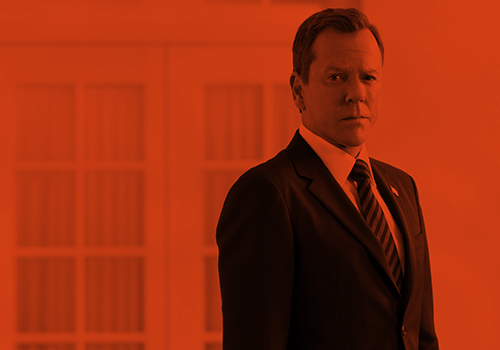 After all, the series rests on the premise of the U.S. government’s destruction paving the way for the untested low-level secretary Tom Kirkman (Kiefer Sutherland) to become the president, despite his almost complete lack of political experience. During a panel discussion with Sutherland and series creator David Guggenheim following a screening of the episode, ABC News’ Elizabeth Vargas was quick to point out that it’s not just the world of Designated Survivor that features a man without political experience as commander in chief — such is the case in the real world as well, with the election of Donald Trump. Given that parallel, and the resulting breaking news that’s occurring on a near-daily basis, how is it possible for the modern political landscape to not impact the Designated Survivor writing process? I’ve just updated the gallery with episode stills from the most recent episode plus tons more stills from the pilot. I will be slowly replacing medium quality stills in the gallery with high quality, as well as getting the episode screencaps up to date.